Amanda's foyer with new transom installed. Amanda contacted me to build a stained glass transom for her 1870 2 story colonial home in Chelmsford, Massachusetts. 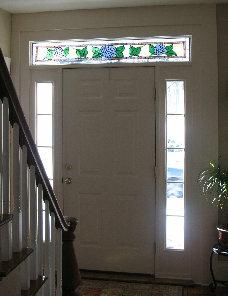 She had a clear glass transom over her front door and wanted to brighten up her foyer with color. She challanged me by asking for hydrangias in her transom. Having no gardening talents, I had no idea what a hydrangia looked like. However, with Amanda's help and a little internet research, we came up with a really nice hydrangia design to fit this long narrow opening. 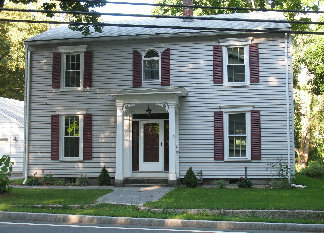 Amanda's 1870 home in Chelmsford, Massachusetts. Amanda was nice enough to send some great pictures of her transom after installation. 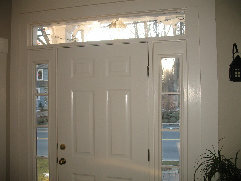 Her transom was completed by Christmas 2008, measures approximately 9 1/2 " x 62 3/4 " and contains 194 pieces of glass. We chose a clear bevel border because the sun shines directly on this transom......nothing sparkles like sunlight through bevels. The bright green leaves, irridescent blue flowers, and beige background all add color and warmth to Amanda's foyer in her beautiful classic home.